Have you ever watched a cooking show? If so, then you might have seen a gun-like equipment that throws flame at desserts and other dishes. Well, if you totally love creating awesome dishes like “baked Alaska” or lemon meringue pie, then you will need the best kitchen torch. From caramelizing fruit or finishing off a crème brulee to torching meringue or roasting peppers, a high-quality culinary torch is a must for any aspiring gourmet home chefs. Why Do You Need a Kitchen Torch? Kitchen Torches: How to Use One? What to Look For When Buying the Best Kitchen Torch? A kitchen torch is a tool which uses butane, a flammable gas, in order to create an intensely hot flame. It is a lightweight kitchen gadget and does not require any electricity to operate— just a gas canister to throw a powerful flame. Ideal for caramelizing sugars and creating mouth-watering desserts and dishes, the best kitchen torch is very portable and has a myriad of other uses inside and outside the kitchen. So, why exactly do you need a kitchen torch? In order to better understand its importance, I have listed here the following reasons as to why you should invest in a kitchen torch. Perhaps the most common use of a kitchen torch is finishing savory crème brulees. And probably the most daunting part of creating a crème brulee is the caramelization of sugar. With a professional kitchen torch at your disposal, you can achieve the perfect crème brulee you see in a most high-class restaurant. With the help of the best kitchen torch, you can produce a perfect sugar burnt that you need for your crème brulee. If you want to achieve a faultless sous vide meat, then you will need to have your own kitchen torch. If you are a admirer of the sous vide cooking method, then you can sear cooked meat with precision because of the full control you can gain with a culinary torch. Kitchen torches are not only limited to making crème brulees and sous vide cooking. As a matter of fact, most people use a kitchen torch for toasting bread, melting cheese, and grilling toppings that they throw into their desserts or dishes. You can use a culinary torch in baking salmons, cupcakes, sous vide meat, glaze a baked ham, char grill vegetables, mash potatoes, crème brulee frosting and pretty much anything you need fire with. It also proves useful for outdoor tasks such as lighting the barbecue or igniting a fire at a campsite. You’ve probably seen professional chefs use a kitchen torch and it might seem very straightforward to use, but it is not. Yes, using kitchen torches is as easy as clicking a button, however, there is a technique you need to know first in order to make a perfectly torched food. The key in getting the most out of your kitchen torch is to make sure that the flame has a blue tip ensuring that it is an oxidizing flame— which signals that your flame is not too high and that the temperature is just right. Most first-time user usually gets really excited in using kitchen torch that they set the flame too high with a yellow-orange tip. This only means that some hydrocarbons were not properly combusted and might end up on your food. Also, turning the torch on directly above the food is a mistake. Some of the fuel might be transferred accident, leaving you with a food that is slightly off in taste. Moreover, it is better to adjust the flame away from the food first, so that it will not get too burnt. A kitchen torch is a pretty simple tool. However, if you want to have the best out there, here are some things you need to look for when shopping. Look for a kitchen torch with an instant ignition button or trigger so that you do not need a separate flame or spark to light it. Some kitchen torches have a trigger that you need to continuously depress when lit, while there is some with button which keeps it lit until you turn it off. This is a useful feature since you can comfortably hold the torch and never mind about it losing flames. Kitchen torches that are typically made for use in the kitchen are oftentimes self-contained the refillable fuel chamber like that of a cigarette lighter. These torches are comfortable to hold, however, they may require frequent refilling. Some torches, on the other hand, which are specifically designed for broader use has a screw onto the top of the fuel canister that ranges from the size of a shaving cream container to a much larger one. This should depend on your intended use. There are torches with small, very concentrated flames. This can be safer; however, it makes other process such as searing a large cut of meat, very difficult. There are other torches with a useful feature of allowing you to adjust the strength of the flame you want to use. The most common type of fuel used in culinary torches is propane and butane— which are both fine to use. Propane burns a bit hotter, but butane tends to be a lot cheaper. There are also some torches which use MAPP/MAP gas which burns even hotter than propane. Look for a kitchen torch which allows you to adjust the size of the flame which suits that food you are making. Find a torch with a gas flow adjustment lever which gives you control of the flame it produces. Remember that a kitchen torch should produce a flame that is narrow, short and dark blue. If the flame is too big, then it is not safe. A kitchen torch should have a long anti-flare neck— it is quite important that the flame it produces is precise and can work from any angle. If it is not, then you will need to go through unnecessary trouble just to do something that is supposedly simple. Choose a kitchen torch with ergonomic designs in order to boost efficiency and provides ease of use. 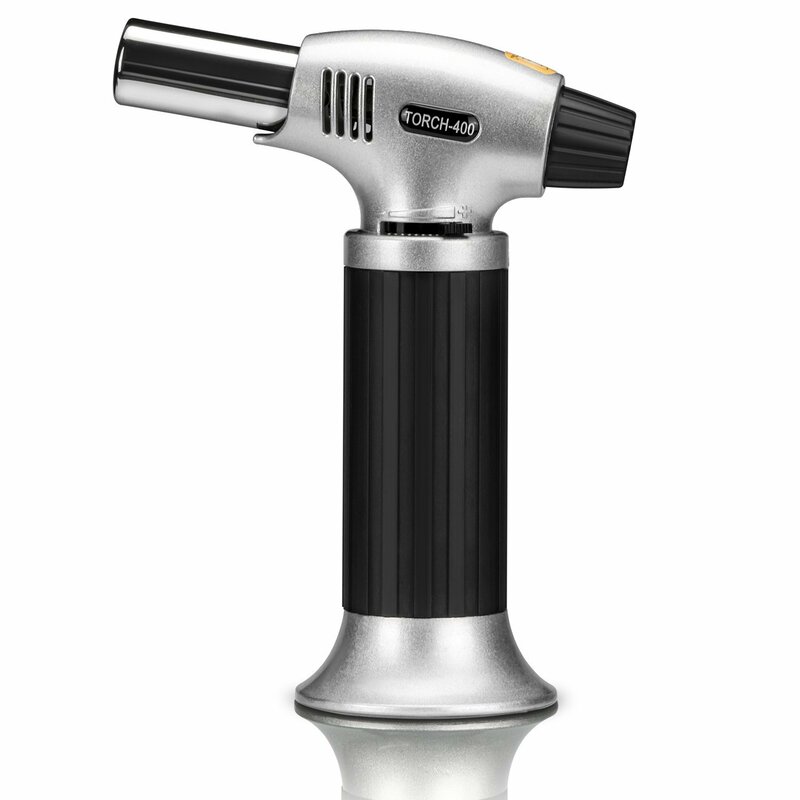 Poorly designed kitchen torches can cause discomfort and redness on hands and might also cause accidents. Poor grip on torch might end up slipping off your finger and can be a huge problem if the torch is on. Look for kitchen torches that fit the palm of your hand and also have safeguards like non-slip handles or rigged handles. These not only provide safety but also give you a better control when torching your food. Whenever we buy any product, durability is the one thing we never forget to consider. Items that are not durable enough and break or stopped working after just a couple of uses can cause disappointments and can be very annoying and frustrating. Not only it would be a waste of money, it could also become a safety hazard. If you have little kids, then you should look for a kitchen torch that meets the Child Safety Requirements and have a safety lock feature. We all know how playful kids can be and nothing will ever pass their curiosity. So, remember to look for a child-safe feature in order to avoid any accidents. The best kitchen torch should be effective and fast. This means that it can reach the minimum temperature of 2500° Fahrenheit. If it is lower than that, then the flame will not even be hot enough to make the top of a crème brulee crispy as it should be. What we absolutely about the Gibot Blow Torch Lighter, is the location of the flame controls on its body. Looking at the device, .you will immediately see that the manufacturers put a major focus on user-friendliness. Rather than using a separate trigger, you can just turn the flame on or off by simply using one knob that also combines a button into it. Just press the button in order to ignite the flame and turn the knob counterclockwise to turn it off. The knob for controlling the levels of the flame has been conveniently positioned close to your hands for you to easily change it while it is at work. Another useful feature which is unique to this kitchen torch is its continuous flame. This feature allows you to keep the flames burning continuously for at least five minutes. This is a handy feature since you do not need to keep on pressing the button in order to keep the flame ignited. Its base has been specifically designed to prevent tipping of the torch itself and the body. It is made from Aluminum alloy for durability. 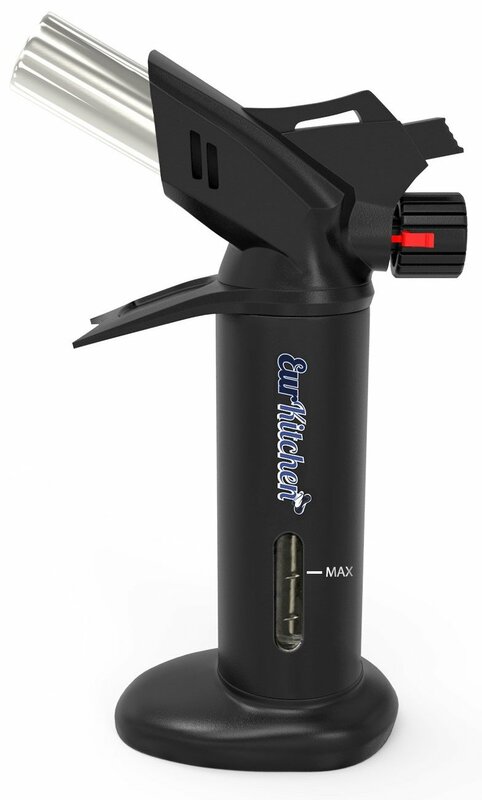 Moreover, the GiBot Blow Torch Lighter can be easily refilled with an 8 to 10 g of butane gas capacity. The LiBA Culinary Torch is a simple, silver kitchen torch that measures 4.5 x 6 x 2 inches. Made from stainless steel for durability, this kitchen torch is built to last a lifetime. It also has a window which indicates how much gas is left inside, which helps you to never run out of fuel accidentally. This kitchen torch is very simple to use: First, you will need to fill the tank with butane gas then turn on the safety lock and use. It features a gas knob which allows you to control the flame strength and comes with an anti-flare technology. 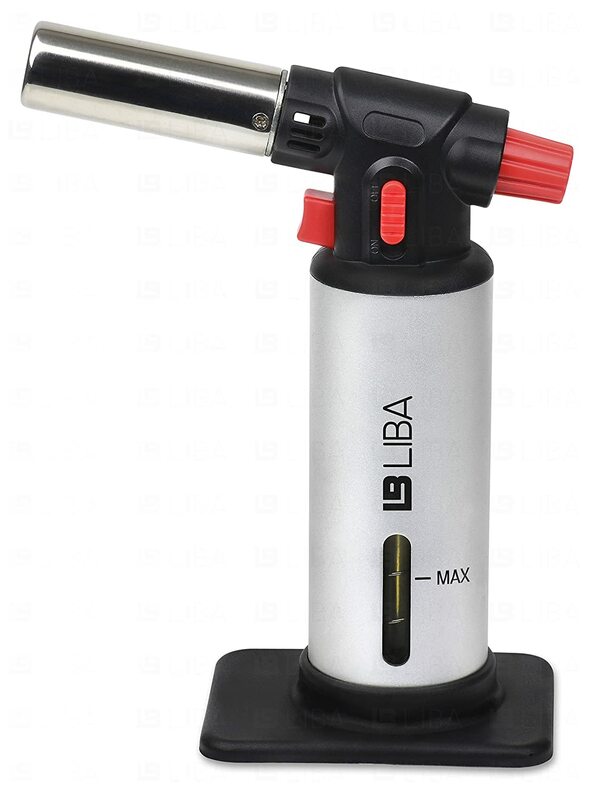 The LiBa culinary torch can burn up to 60 minutes and its nozzle is angled and extended which not only provides precision and more maneuver over the flame but also provides protection of your hands by keeping it away from the hot flames as much as possible. This kitchen torch has a capacity of 16 ml and can be easily refilled. Its base helps it to stand stably on countertop or table top when not in use. Lastly, LiBa offers a 90 days money back guarantee which replaces the product with no questions asked and comes with a 3 years warranty for risk-free buying. This kitchen torch from the Japanese manufacturer Iwantani is a much more portable alternative to other refillable kitchen torches. Simply put, this kitchen torch consists only of the nozzle or the head with flame controls which you can install onto a butane canister before you can use. This kitchen torch is a good option for you if you travel a lot and wishes to shed off some excess burden of having to carry a bulky culinary torch wherever you go. 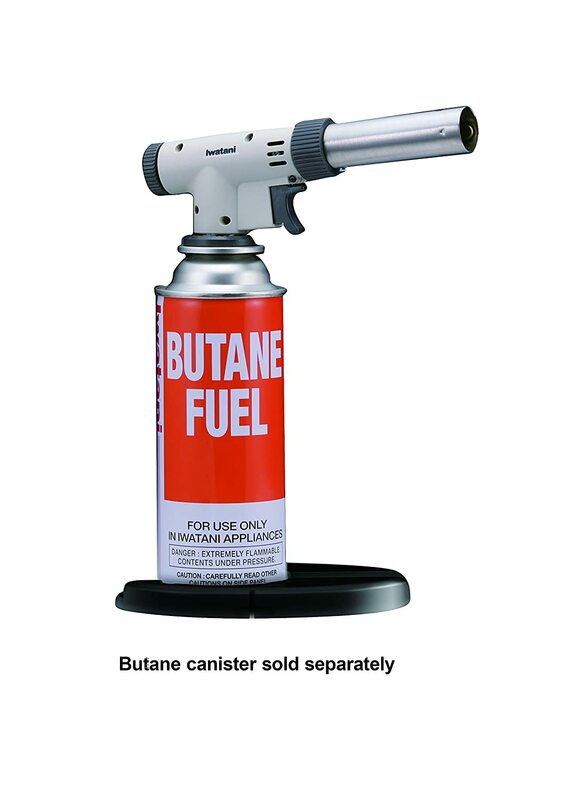 Butane canisters can be easily bought at stored which can be found anywhere. So, as long as you have this kitchen torch with you, then your searing or torching needs will be covered. This sturdy torch features a safety plate which ensures that it is locked firmly onto the canister and helps prevent toppling over that might cause a big mess on your working area. Moreover, it features the Piezo ignition technology which easily switches the flame on whenever you press the trigger. What’s more unique about this product is that it has separate knobs for same shape and flame intensity. Cooking techniques such as searing, caramelizing and charring involves a kitchen torch which needs different flame intensities, thus the more control you have over the flame, then the better it is in crafting a perfect, sophisticated dish. In order to make a restaurant-quality meal then you will need quality kitchen gadget like the EurKitchen Culinary Torch. This premium quality kitchen torch is made or durable yet lightweight aluminum and an ABS black plastic design. Moreover, it has an ergonomic handle which feels comfortable in your hands as you work on your culinary artwork. With the EurKitchen Culinary Torch, you have full control over the flames because of its highly reliable Piezo press button ignition which ensures a consistent spark every time. The flames can reach 2370° Fahrenheit for easy torching or searing and its gas flow regulator can easily adjust the flame for up to 6-inch continuous flame. EurKitchen also keeps your safety in mind and has added a safety feature during operation— the burn-free finger guard which protects your fingers from getting burned and a gas flow safety lock. You can easily refill this kitchen torch and can use any brand of butane. Lastly, EurKitchen offers its buyers a 3-year warranty on this kitchen torch for a risk-free buying. Searzall is a torch attachment that is secured to the top of a kitchen torch in order to create a perfect searing temperature without the off-putting smell that usually results when cooking with culinary torches. By forcing the thin flame of a kitchen torch through 2 layers of high temperature-resistant and fine wire mesh, this kitchen torch attachment can produce an evenly spread and consistent flame which provides a professional quality finish to dishes and desserts. Its back screen is coated in palladium that provides an even temperature and oxidation resistance. This handheld cooking device can turn a kitchen torch into a handheld broiler which makes delicious meal preparations in only a short amount of time. Searzall torch attachment is compatible with the 16.4-ounce propane tank and Bernzomatic TS8000 torch head. And now, the best kitchen torch award goes to: LiBa Culinary Torch! 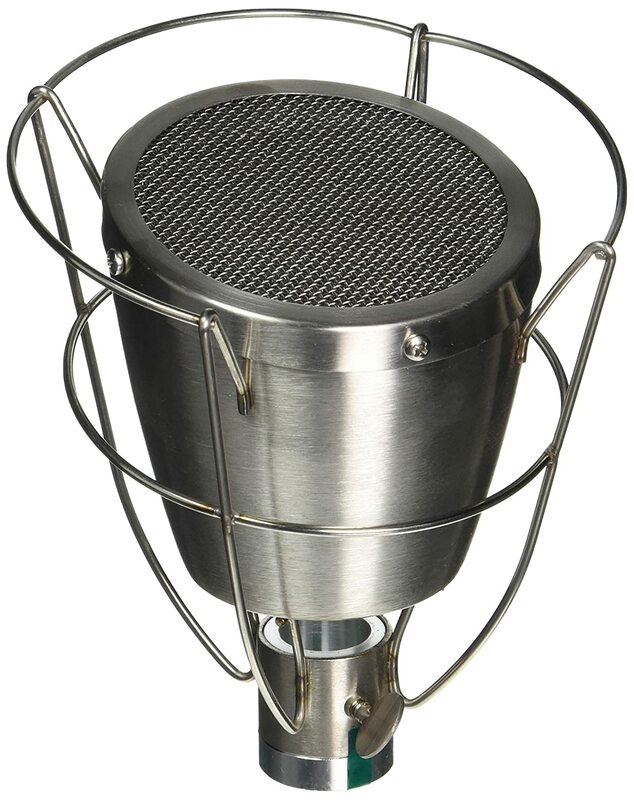 Its stainless steel build makes it very durable. Not only is it very simple to use with a couple of safety features for an accident-free cooking. Also, it has a window which gives you an idea on how much fuel is left inside so you never ran out of gas in the middle of torching. Lastly, its 90 days money back guarantee and 3 years warranty is a big plus if you are not entirely sure about the product and all. A kitchen torch is but simple kitchen gadget that ignites your cooking skills and helps you create professional culinary artwork which can mesmerize your family and friends. There are numerous kitchen torches available in the market today, however, the ones I’ve listed here are among the best there is. I hope this guide gives you plenty of information in order to make the right decision for your own torching needs. If you have any question or suggestion, feel free to hit the comment section!